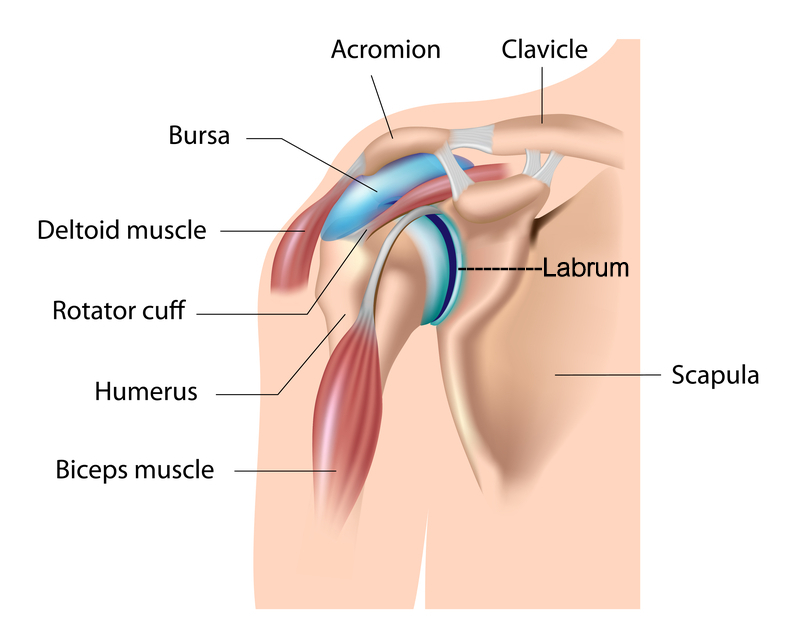 Tips for a Torn Shoulder Labrum. A torn SLAP tear can be associated with “clicking and catching” when the arm is moved in certain directions. Many throwing athletes will complain of a “dead arm” when a SLAP tear is present. There is generally no instability in the patient’s shoulder when a SLAP tear is present. Pain with certain movements is the primary complaint of the patient who has a SLAP tear. Seek and follow the advice of your Physical Therapist following the SLAP lesion repair and you will enjoy a successful return to your pre-injury lifestyle. 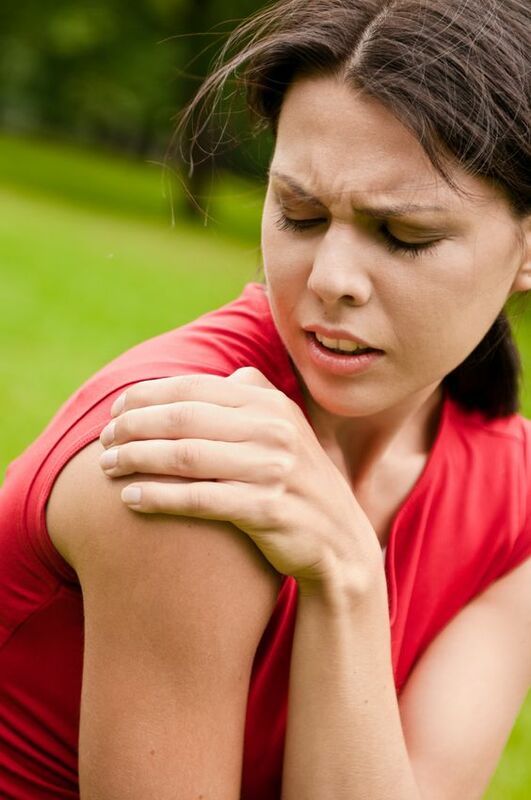 An injury to the shoulder can cause pain, decrease in movement, and loss of strength. As a result, you may begin to limit shoulder motion and limit activities. One common symptom is pain that occurs in the shoulder, originating in the front and spreading down the front of the upper arm. These types of pains and injuries can be caused by repetitive above shoulder movements such as throwing a ball or swimming. If you have dealt with the ache and discomfort for a long time, you may want to talk with your physician and physical therapist about a plan of recovery. One common shoulder injury is a torn shoulder labrum or a Superior Labrum Anterior Posterior (SLAP). To get a better picture of the SLAP consider the shoulder joint. It is made up of three bones: scapulae, humerus, and clavicle. There are four RTC muscles responsible for keeping the humeral head on the glenoid fossa of the scapulae. The movement of the shoulder joint is dependent upon the humeral head’s articulation on this surface. If the motion is “pure” and normal, the head is held in the center of the fossa by the synchronized muscle action of the RTC. The ligaments and Labrum offer static stability to the shoulder joint. The Labrum is a fibrocartilage “ring” that is attached to the outer edge of the Glenoid Fossa. The Labrum “deepens” the socket and helps to prevent the Humeral head from “sliding” off of the shallow fossa. When the labrum tears away from the Glenoid Fossa, it can cause major problems. To picture this, think of the face of a clock. The 12 o’clock position has the Long Head of the Biceps tendon attached to it. Constant pulling, stretching, tugging or compression on the top portion of the Labrum can damage it and pull it away from the bone. When this occurs it is called a SLAP (Superior Labrum Anterior Posterior) tear. Every time the Long Head of the Biceps engages and contracts, the damaged Labrum is affected and causes pain in the shoulder. Movements above shoulder level and when moving the arm backwards with a fully extended elbow are the two most prominent pain-producing motions. Treatment usually begins with conservative approaches that involve stretching and exercises and other protocols. When these treatments fail to resolve the symptoms, the Labrum needs to be surgically re-attached to the bone. In most cases, the surgery is performed via an arthroscopic procedure, and the Labrum is held to the prepared bone by sutures and bone anchors. The size and extent of the tear determines how many suture anchors are needed to hold it in place until the natural healing process occurs. Formal Physical Therapy normally begins within 7-10 days of your surgery. Most surgeons will limit your range of motion and active movement in certain planes of motion for a couple of weeks. The primary protective action taken to preserve the repaired Labrum is avoiding any motion or activity that will engage the Long Head of the Biceps tendon. The active contraction or aggressive passive stretching could damage the repair and tear the Labrum away from the bone. Your Physical Therapist can instruct and guide you through the formal rehabilitation process and ensure a speedy and safe recovery to a fully functional shoulder. Pain: The amount of pain felt post operatively is different for everyone. For the first 24 hours, pain is usually controlled through a long lasting (several hours) numbing agent and possibly a nerve block that the surgeon injects. The day after a surgery, the shoulder is very painful if you moves the arm. Pain levels at rest can vary greatly. While the intense pain usually decreases within a few days, you should be prepared to experience varying levels of pain throughout the rehabilitation process. During this time, your recovering should will be manually stretched and mobilized by the therapist. This will cause pain at the end range of motion. Wearing a sling: For the first couple of weeks, the surgeon will require you to a use sling that protects the repaired Labrum from quick and sudden motions. This sling should actually help comfort the recovering area while also reducing inflammation. Inflammation causes more pain, less movement and loss of neuromuscular control. Swelling and bruising: Your shoulder might be swollen and there might be bruising in the area around the suture sites. The swelling can extend down the entire arm and into the hand. Repetitive squeezing of a soft object (e.g. stress ball, ball of socks or a sponge) will help to prevent and/or eliminate the swelling in the hand. Bruising may occur in the area around the suture sites and possibly extending into the chest or upper arm area. Repetitively bending and straightening of the elbow can help to reduce the swelling and discomfort in the upper arm. When moving the elbow, there should be no weight in the involved hand and the use of the non-involved hand might be needed to help with the motion. Sleeping: Sleeping is difficult and most patients will sleep in an upright position for several days. Placing a pillow behind the involved shoulder helps to prevent it from “rolling” backwards during sleep. Once you get back into the bed, you may find it more comfortable to wear the sling or prop a pillow under their arm and against the involved shoulder blade. It usually takes several weeks to get comfortable enough to lie on the involved side. Driving: Returning to the driver’s seat is determined in part by which shoulder is involved, if the transmission is automatic, and if you have quit taking narcotics.The doctor ultimately determines when you are ready to drive. If the pain level and movement is adequate, you should be able to resume driving within the few days of surgery. Return to work: Depending on the type of work, you might return to work within a few days. If your job is physical, you’ll will have to discuss a return date with the doctor. Most people can return to some capacity of work within one week of the surgery date. If your job is physical in nature, it might be several months before you can return to a full duty capacity. Having fun: You should be able to participate in recreational sports, hobbies and leisure activities when the shoulder has healed sufficiently to support the movements and actions associated with that activity. If a specific activity requires you to throw or move the involved arm above shoulder level repetitively, it will take 4-6 months (minimum!) to be able to successfully return to that activity. You should discuss return date with the doctor and physical therapist. SLAP tears are troublesome and painful. While the shoulder remains fully functional, the damage and pain can cause you to modify many motions. If the torn Labrum surgery is successful, you can expect to return to all pre-injury activities providing you follow the guidelines of the rehabilitation program which will be established by the surgeon and Physical Therapist.